If you think the European Union is having a difficult time in adopting a unified position on the establishment of a constitution to govern the Europe . The troubles facing the EU is nothing compared to the division that exist within Ukraine. The only point of agreement is that the constitution needs change. The current political crisis, brought about by the President, Viktor Yushchenko’s dismissal of Ukraine’s democratically elected parliament, has highlighted a number of issues that need to be addressed. There are essentially two main variants on the table, each with a multitude of variations within each variation. Viktor Yushchenko and the Our Ukraine group are advocating a return to a system of Presidential rule by decree where the power and authority of government is invested in the hands of the president, who would have the right to determine who should be prime-minister and hold ministerial positions with the parliament being sidelined to as a legislative rubber stamp. System of government should not be decided on the basis of any one individual or political party. Clearly the president and his political party have a vested interest in pursuing a presidential model as opposed to supporting a parliamentary democracy. The Governing Coalition spearheaded by Dr Olexandr Moroz has proposed that Ukraine become a full parliamentary democracy in line with other European States. The proposal for Ukraine to become a full preliminary model is backed up by recommendations outlined in a recent PACE review arsing form the president’s political crisis. One of the multitude of sub-variants is the proposal to create a bicameral (two house) parliamentary system. Yulia Tymoshenko, defacto opposition coalition leader, in the mean time has a foot in each camp. Yulia Tymoshenko rightly has opposed the need for a bicameral parliament and has called for a panel of experts to draft two draft version of a constitution which in trunk will be put to the people of Ukraine who will decide in a referendum which constitution to adopt. As if the people of Ukraine will be capable in deciding the complicated issues of a the details of a draft constitution let alone the of each system. Clearly Ukraine needs to decide first and foremost Presidential or Parliamentary. The outcome of this simple question begins to decide a host of other issues that need to be considered in depth before any agreement could be reached on the details of a constitutional framework. Constitutional reform is not that easy to obtain agreement, as we have seen with the formation of the European Union Constitution. A referendum will only be successful if there is broad agreement and compromise. If the political spectrum is divided then the odds are against any meaningful reform being adopted. Face with a complex difficult decision the people will always vote no before yes. historically this has been the case world wide. If Ukraine is to adopt meaningful reform any proposal needs broad consensus. To add to the complexity of constitutional reform Yulia Tymoshcneko has proposed that politicians be left out of the Constitutional reform process. Pandering to a popular misconception keep politics out of politics. Yulia Tymoshenko’s proposal is beyond reality or belief binging into question her sincerity or level of serious responsibility. Politicians and experts must work together to achieve a workable and acceptable document. Yes by all means have the debate Parliamentary Democracy versus Presidential Dictatorship but do so out of sequence of the political parliamentary electoral process and do so before finalising a proposed draft of a new constitution. The ideal time to hold a ballot on the question of Presidential or Parliament would be next year, either six prior to presidential election or held back and held in conjunction with the 2009 presidential election. Ukraine must look to Europe, first and foremost, in helping to determine and resolve the questions of constitutional reform and not to the United States or Russia. As it stands Ukraine looks set to having a multitude of versions and a multitude of conflicting visions for Ukraine’s democratic governance. A sure fire recipe for disaster and ongoing failure. LEvko of ForiegnNotes has translated the following text from an article by Sonya Koshkina (In Ukrainain). Sonya in her opinion piece raises a provocative hypothesis. A little out of date but worthy of consideration. The formation of a democratic mega-bloc has fizzled out, as could have been predicted, in many respects because Yushchenko himself has personally taken over manual control of the process. He has done this in order to simultaneously neutralize both Lutsenko and Tymoshenko – two of his main opponents in the 2009 presidential elections. Once this is accomplished, then he can tackle Yanukovych. Current NU leader Vyacheslav Kirilenko is not a crowd-pulling political heavyweight so Yushchenko has bowed to former socialists Yuriy Lutsenko’s demands and promised many of his National self-defence people top jobs in any NU government, in exchange for his joining forces with NU. In this way the popular Lutsenko may be kept in check. The smaller right-wing parties in NU will probably be dumped. However, Lutsenko’s appearance in the orange bloc reduces the chances of a broad coalition being formed, and could even threaten the elections themselves, according to some Pot party workers. Sonya Koshkina claims that Viktor Yanukovych agreed to early elections only because the president promised him that NU and “Regionally” would form ruling coalition after the elections. They also secretly mutually agreed to ‘knobble’ Tymoshenko. About a week before Ivan Plyushch’s appointment as National Security and Defence Council secretary he contacted that old political fixer, the Donetskiyite Yefim Zvagelsky. These two senior statesmen outlined a plan between themselves to overcome the crisis by forming a broad coalition, and this meant combined action against Tymoshenko. They then met head of the press secretariat Viktor Baloha, and further plotting took place – the president being well aware of what was going on. Subsequently Rinat Akhmetov and Raisa Bahatyrova met Yushchenko, who later praised Akhmetov for his assistance in solving the political crisis. Mutual dislike of Tymoshenko is the only factor that Yu and Ya share – both have presidential ambitions, so both need to remove Tymoshenko from their path. According to Koshkina, they are both are planning a dirty election campaign, which could even involve the SBU security services, to discredit Tymoshenko. O.K, this could be wild speculation, but politics in Ukraine is a rough trade..and the elections are a long way off.. 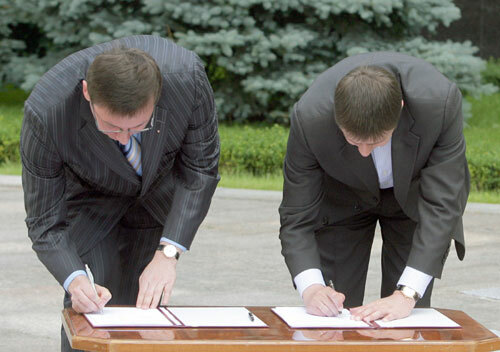 The long and at times agonising negotiations over the formation of a political alliance between Our Ukraine and the breakaway dissident People’s Self-Defence party has finally been signed. (Link: Ukrayinska Pravda). The details of the agreement have not yet been published. The formation of the alliance will put pressure on Yulia Tymoshenko as the new political bloc could very well secure the most votes at the election and as such will decide who will become prime-minister. Previous polls have shown Yulia Tymoshenko Bloc and a possible Our Ukraine alliance neck and neck for public support. Each with around 16-19% of the vote. The established alliance may deliver much needed “public relations” benefits as Our Ukraine tries to bolster its public appeal and win back public trust. The down side is that according to recent polls the People’s Self-defence group would receive more then 3% of the vote and as such would have had a reasonable chance of being elected to the parliament in its own right, giving it much more freedom of movement and control over decision making. The upside is that its leaders are guaranteed to be elected in an expanded alliance. The other possible downside is that whilst a number of people would have been prepared to support and vote for the People’s Self-Defence Party as a stand alone party they may not continue to attract the same support as a junior partner in what is seen as a marriage of convenience. On the numbers game People’s self-defence would have been better off remaining unencumbered as a stand alone party. It is early days in the campaign and whilst there will be an expected “honey moon period” as the campaign begins to take form and the issues facing Ukraine are discussed things could go anyway. With around 15% of Ukrainians uncommitted the outcome is still an unknown quantity. There was one poll published on Union news site ,that was not well sourced, that claimed five parties would obtain 3% or more of the vote and enter into parliament. This poll goes against the trend and all other qualitative polls in that it shows a slender win to the opposition forces. There are a number of inconsistencies in the UNIAN poll analysis. The poll has indicated support for the Lytvyn Party at 2.7% yet last week Lytvyn had announced that he would not be standing for election. The poll also shows The Socialist Party of Ukraine on 2.9% and Natalia Vitrenko block on 2.8%. The error of margin of most polls is around 2% and errors are more prevalent at the bottom end of the poll. Should either the SPU and/or NVB exceed the 3% threshold then the outcome would most certainly change. A narrow win would not serve well for any government. What Ukraine needs more then anything is political stability and a marginal “opposition” government would not deliver a good outcome. From an analytical point of view this question only comes into play when you have a party/group who is within 0.3-4 percentage points of the three percent quota threshold but it is significant. Some electoral systems base their threshold on a percentage of the formal vote (Votes that indicate support for a party as opposed to a blank vote) In Ukraine’s case the threshold percentage also includes informal votes in its calculation. But if a high percentage of eligible voters do not vote (the non-participation rate) the percentage ratio shifts. I also expect that there will be intense battle to try and persuade some of the minor parties to join forces in an attempt to cross the artificial 3% threshold barrier. Party Viche (I personally like their policies and their leader comes across as informative and rational). Party Viche accounts for just under one percent of the vote which could prove valuable to other parties bordering on the threshold or who want to increase their percentage and representation. The polls wont give any real indication of the fold up until the party lists are finalised. What is interesting the most about current lot of polls is that there has been little shift in the fortunes of the president’s party Our Ukraine. One poll had Our Ukraine out polling Yulia Tymoshenko but they were reliant on the formation of a broad coalition with the dissident breakaway People self-defence group. It is expected that they will secure sufficient percentage of votes to stand alone and unencumbered. If they do not form an alliance with Our Ukraine then Yulia will be in a better place, should the opposition win government to become prime-minister. That is unless Our Ukraine buddy up with party of regions to cut the Communists out of the game, which is not beyond consideration as foreign notes predicts. You are currently browsing the Ukraine Today blog archives for June, 2007.